Brighouse Town have been rocked by the resignation of manager Paul Quinn after almost six years in charge. His co-assistants Lee Ashforth and Mark Booth are also leaving the Hove Edge club, which finished ninth in the Evo-Stik NPL First Division North table last Saturday. Quinn said: “It is the right time for me and the club to go our separate ways. “After gaining invaluable experience and leading the club out of the NCEL and establishing them as a top Evo Stik side, it is now time for me to seek a new challenge in football. “Brighouse gave me an unbelievable opportunity aged 27 and I have enjoyed every minute of my time at the club. Tolley said: “It is with great regret that we have accepted the resignation request of Paul but recognise and respect the reasons he has given for this decision. “Brighouse Town Football Club is where it is today due in main to the contributions on and off the pitch that Paul has made. He goes with our blessing and best wishes. Quinn joined Brighouse Town in 2011, leading the club to fourth and second place finishes before securing the NCEL league championship in 2014. 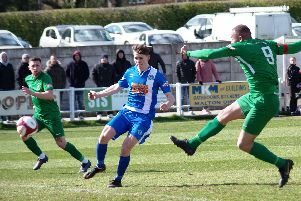 Quinn secured Town’s status in the Evo Stik League before leading Town to their highest ever finish this season. The departures of Halifax-based Ashforth and Booth, a former player and reserve team boss, leaves Town needing a new management team. Booth has indicated that he would like to stay involved as a member of Town’s committee.